3. Scoop the batter into 6 cupcake liners 3/4-full. Divide the remaining batter into the prepared round pans. Bake the cupcakes for about 25 minutes, and bake the cake rounds about 35 to 40 minutes, or until a toothpick inserted in the center comes out clean. Let the cake cool in the pan for 20 minutes, then remove the cake layers to a wire rack to cool completely. 4. When the cake is cool, you’re ready to assemble. Place one layer on a serving plate, and tuck strips of waxed paper underneath the sides of the cake. 5. Prepare the frosting: In a large bowl, beat butter and cream cheese at medium speed with an electric mixer until creamy. Gradually add powdered sugar, beating at low speed until blended. Increase speed to medium, and slowly add milk and vanilla, beating until smooth. Microwave chocolate chips in a microwave-safe bowl at MEDIUM 1 1/2 to 2 minutes or until melted and smooth, stirring at 30 second intervals. Gradually add melted chocolate to mixture; beat until blended and smooth. 6. Frost the 1st cake layer. Set the 2nd layer on top of the first. Frost the 2nd layer and along the sides of the cake too. Stick Kit Kat’s to the sides of the cake, leaving a very small space in between each Kit Kat (1/4-inch). Wrap a bow around the cake, securing the Kit Kat’s. 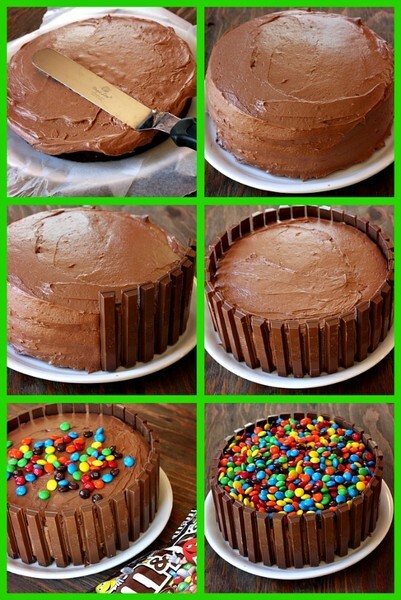 Fill the top of the cake with M&M’s. Pull out the strips of waxed paper and discard. Use any extra frosting to frost your 6 extra cupcakes. 7. If you refrigerate the cake for a couple of hours or so, it will be much easier to cut and serve. Of course, you’ll need to remove the bow just before serving. *You can also use a yellow cake or your favorite flavor… following the same instructions here for jazzing it up. *Technically, you can use all of the batter in two 9-inch round pans, but it might make the cake too high to work for this recipe. You don’t want the cake to stand higher than the height of the Kit Kat’s- or they will not be able to act as a “fence” to hold in the M&M’s.